This manuscript is dedicated to Professors Lisa and Fereydoon D’Javadi, Pasteur Institute, Paris, on their retirement, and in memory of Professor Esmail Meisami, Department of Neuroscience, University of Illinois, Urbana Champaign. Treatment of major depression (MD, or major depressive disorder, MDD), concurrent with several chronic conditions, involves learning and experimentation before changes in thinking, behavior, deportment, self-discipline, medications, and nutritional supplements afford relief. MDD induces sadness, hopelessness, anger, isolation, and disables sufferers. It dysregulates sleep and hunger, destroys one’s ability to thrive, and mars joys in the lives of sufferers, caregivers, family, and friends. MDD does remit, it has no cure yet, and its toll is second only to cardiac diseases.1 Herein, we explain the case of a patient and the methods he discovered to gain and sustain euthymia. Later, the same methods helped him emerge positive from adult onset craniopharyngioma with minimum losses. We hope this report will inspire physicians and patients with chronic conditions to publish their accounts in peer reviewed journals so much insight is available to help chronically ill patients manage themselves, their diseases, and live positive productive lives. Figure 1 Signs observed in the current case. Notes: (A1, A2) Congenital hyper-flexibility type EDS (red arrows, elbows);4,5 (B1, B2) recurrent urticaria and eczema on torso (B1) and hands (B2);4,5 (C) MS and MDD-related ventricular enlargement and occipital lobe bending (OLB, blue and white arrows, respectively);1,2,6 OLB is also shown in (G). (D) EDS-related unilateral periventricular heterotopia (PH, red arrow), which supports the patient’s dyslexia diagnosis.7 (E) Red arrow, MS lesions along body and splenum of corpus callosum. They indicate difficulties in coordinating R/L hands and may portend cognitive decline.8,9 Yellow arrow – craniopharyngioma (0.9 cm3) comprising papillary (soft, anterior), and adamantinous (hard, posterior) cysts bound by a single epithelium.10–12 (F) Yellow arrow, conjoined craniopharyngioma cysts (soft ~2.3 cm3 and hard ~0.5 cm3). At this stage, the tumor pressed against his optic chiasm (thin gray arch above the cyst, blue arrow) and caused bitemporal hemianopsia (bilateral peripheral vision losses).10–12 (G) Red arrow, EDS-related nasal cartilage defect.4,5 White arrow, OLB.6 Yellow arrows, single voxel (box) MRS of papillary cyst showing characteristic alkyl fats and hydroxyl resonances at δ ≅1–2 and 3.5–4.2 ppm, respectively. Other CNS metabolites are not seen in papillary craniopharyngioma tumors. These MR-spectral characteristics are only seen in papillary craniopharyngiomas.11,12 Adamantinous cysts do not display MR-spectral resonances. Note, in this case report the corresponding author (NDS) is the patient. Abbreviations: EDS, Ehlers Danlos Syndrome; MS, multiple sclerosis; MDD, major depressive disorder; OLB, occipital lobe bending; R, right; L, left. Owing to recurring asthma, respiratory tract and lung infections, urticaria, and multiple allergies to fish products, Bactrim® (sulfamethoxazole/trimethoprim, morphine-based analgesics, etc. ), at age 19, the patient was diagnosed selective immunoglobulin-M (IgM) deficient;13,14 and by mid-40s had lens replacements for premature cataracts; and three rhinoplasties and uvula removal to correct rhinitis and apnea. Selective IgM deficiency now appears prominently on his medical charts because when overlooked, and intravenous antibiotics not used during surgeries, he suffered infections that took months to resolve with antibiotics. Thereafter, from late 2015 (November or December) to April 2017, the pateint enjoyed an affable and productive state of mind (BDI between 5 and 15) (Box 1).19,20 He wrote manuscripts, and enjoyed scuba-diving trips to Florida , Hawaii, and the Caribbean. In March 2018, the patient had R=20/25 and S=20/70 vision; his coherence tomography showed left optic nerve atrophy, blurry central vision (scotoma) in the left eye; and his tumor had reduced 82% to ~0.41 cm3.35,36 At present, he manages himself, walks a mile in ~22 minutes with crutches, runs on-spot multiple times a day with support to deal with narcolepsy, scuba-dives, and participates in writing and editing scientific review articles. His weight is 241 pounds (BMI 33.1), and weight management with episodic steroid use is a challenge. Altered tryptophan metabolism, namely, over production and accumulation of kynurenic acid (KA, causes excitotoxicity); 3-hydroxylkyneurenine (3HK, free radically damages cells); and quinolinic acid (QA, causes neuron loss). Tenaciously work to transcend disease-induced limitations by healthful means. The above require rigorously studying current texts and science literature to find methods that accrue health benefits and improve mood, alertness, and physical and cognitive functioning. We hope for all chronically ill patients, healing becomes an all-consuming puzzle to solve without giving-in to misery, or seeking untimely exit. This patient derives much joy and fulfillment by researching and finding new solutions to problems. Having said this, we realize, that methods and attitudes we discussed may not work for all patients; so, we want to read and learn new approaches to euthymia from patients and physicians who treat the chronically ill.
We thank Professors Bin Teh, Armen Kocharian, Steve Fung, and David Baskin, Radiation Oncology, Radiology, and Neurosurgery Departments, Houston Methodist Hospital for managing NS’s craniopharyngioma and associated problems; Professors Keki and Mazda Turel, Department of Neurosurgery, Bombay University for helpful discussions on endocrine and anatomic changes in MS, MDD, and craniopharyngioma; Dr James G Nadeau, US Food and Drug Administration, Silver Springs, MD; and Professor Naozumi Teramoto, Chiba Institute of Technology, Chiba, Japan for references, many insightful discussions, and editing and improving the quality of our manuscript. Using his clinical records, NDS wrote and edited the entire manuscript. 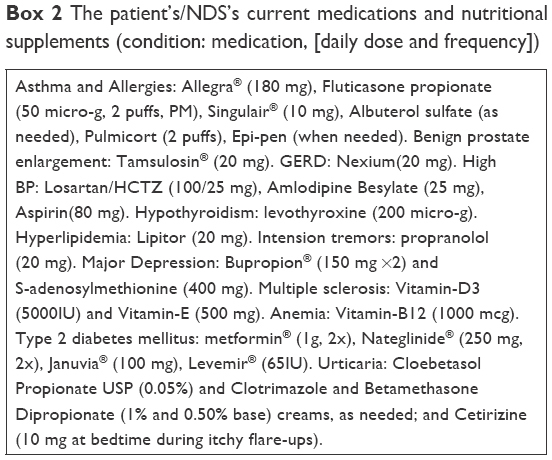 After reviewing his clinical records, coauthor AS focused NDS’s attention (between 2013 and 2015) on inflammatory triggers to help him manage MDD and helped with early editing. DEH was invited as coauthor because of his knowledge in neuroscience. He edited the first draft. All authors contributed toward analysis of the case and its clinical data; drafting and revising the paper; and all agree to be accountable for all aspects of this work. O’Reardon JP, Amsterdam JD. Medical Disorders and Treatment Resistant Depression, in Treatment Resistant Mood Disorders. Amsterdam JD, editor. UK: Cambridge University Press; 2007:405–429. Scott ML, Golden CJ, Ruedrich SL, Bishop RJ. Ventricular enlargement in major depression. Psychiatry Res. 1983;8(2):91–93. Hershenfeld SA, Wasim S, McNiven V, et al. Psychiatric disorders in Ehlers-Danlos syndrome are frequent, diverse and strongly associated with pain. Rheumatol Int. 2016;36(3):341–348. Kumar V, Abbas AK, Aster JC. Ehlers Danlos Syndrome, in Chapter 5, Genetic Disorders; in Robbins and Cotran, Pathologic Basis of Disease. 9th ed. Philadelphia, PA: Elsevier; 2015:137–183; 145–146. Genetics Home Reference. Ehlers-Danlos syndrome. Available from: https://ghr.nlm.nih.gov/condition/ehlers-danlos-syndrome#genes. Accessed September 12, 2018. Maller JJ, Thomson RH, Rosenfeld JV, Anderson R, Daskalakis ZJ, Fitzgerald PB. Occipital bending in depression. Brain. 2014;137(Pt 6):1830–1837. Sheen VL, Walsh CA. Periventricular heterotopia: new insights into Ehlers-Danlos syndrome. Clin Med Res. 2005;3(4):229–233. Dogonowski AM, Andersen KW, Madsen KH, et al. Multiple sclerosis impairs regional functional connectivity in the cerebellum. Neuroimage Clin. 2014;4:130–138. Jongen PJ, Ter Horst AT, Brands AM. Cognitive impairment in multiple sclerosis. Minerva Med. 2012;103(2):73–96. Osborn AG, Salzman KL, Jhaveri MD (editors). Craniopharyngioma, in Diagnostic imaging. Brain. 3rd ed. Philadelphia, PA: Elsevier; 2016:1048–1051. Einstien A, Virani RA. Clinical Relevance of Single-Voxel (1)H MRS Metabolites in Discriminating Suprasellar Tumors. J Clin Diagn Res. 2016;10(7):TC01–TC04. Saeger W. New aspects of tumor pathology of the pituitary. Pathologe. 2015;36(3):293–300. Gupta S, Gupta A. Selective IgM Deficiency – An Underestimated Primary Immunodeficiency. Front Immunol. 2017;8:1056. National Center for Advancing Translational Sciences [webpage on the Internet]. Selective immunoglobulin M deficiency; SIgMD. Available from: https://rarediseases.info.nih.gov/diseases/12547/selective-igm-deficiency. Accessed September 12, 2018. López S, Thomas MG, van Dorp L, et al. The Genetic Legacy of Zoroastrianism in Iran and India: Insights into Population Structure, Gene Flow, and Selection. Am J Hum Genet. 2017;101(3):353–368. Kariminejad A, Bozorgmehr B, Khatami A, Kariminejad MH, Giunta C, Steinmann B. Ehlers-Danlos Syndrome Type VI in a 17-Year-Old Iranian Boy with Severe Muscular Weakness – A Diagnostic Challenge? Iran J Pediatr. 2010;20(3):358–362. Bignami GS, Raybould TJ, Sachinvala ND, et al. Monoclonal antibody-based enzyme-linked immunoassays for the measurement of palytoxin in biological samples. Toxicon. 1992;30(7):687–700. Sachinvala ND [webpage on the Internet]. Tetrodotoxin immunoassays, Phases 1 & 2. Available from: https://www.sbir.gov/sbirsearch/detail/179668 and https://www.sbir.gov/sbirsearch/detail/179842. Accessed September 12, 2018. Veauthier C, Gaede G, Radbruch H, Wernecke KD, Paul F. Poor Sleep in Multiple Sclerosis Correlates with Beck Depression Inventory Values, but Not with Polysomnographic Data. Sleep Disord. 2016;2016:8378423. Benedict RH, Fishman I, McClellan MM, Bakshi R, Weinstock-Guttman B. Validity of the Beck Depression Inventory-Fast Screen in multiple sclerosis. Mult Scler. 2003;9(4):393–396. Chen YF, Huang XY, Chien CH, Cheng JF. The Effectiveness of Diaphragmatic Breathing Relaxation Training for Reducing Anxiety. Perspect Psychiatr Care. 2017;53(4):329–336. Cramer H, Lauche R, Langhorst J, Dobos G. Yoga for depression: a systematic review and meta-analysis. Depress Anxiety. 2013;30(11):1068–1083. Tiers M. Integrative Hypnosis a Comprehensive Course in Change. New York: Melissa Tiers Publisher; 2010. Bandler R, Grinder J. Patterns of the hypnotic techniques of Milton Erickson, MD, Volume 1, Cupertino, CA: Meta Publications; 1975. Gwathmey K, Balogun RA, Burns T. Neurologic indications for therapeutic plasma exchange: an update. J Clin Apher. 2011;26(5):261–268. Kamm CP, Uitdehaag BM, Polman CH. Multiple sclerosis: current knowledge and future outlook. Eur Neurol. 2014;72(3–4):132–141. Fernández Ó. Future challenges in multiple sclerosis. Med Clin (Barc). 2014;143(Suppl 3):44–47. Pardini M, Capello E, Krueger F, Mancardi G, Uccelli A. Reward responsiveness and fatigue in multiple sclerosis. Mult Scler. 2013;19(2):233–240. Triantafyllou N, Evangelopoulos ME, Kimiskidis VK, et al. Increased plasma homocysteine levels in patients with multiple sclerosis and depression. Ann Gen Psychiatry. 2008;7:17. Røsjø E, Steffensen LH, Jørgensen L, et al. Vitamin D supplementation and systemic inflammation in relapsing-remitting multiple sclerosis. J Neurol. 2015;262(12):2713–2721. Cervenka I, Agudelo LZ, Ruas JL. Kynurenines: Tryptophan’s metabolites in exercise, inflammation, and mental health. Science. 2017;357(6349):eaaf9794. Bartsch T, Rempe T, Wrede A, et al. 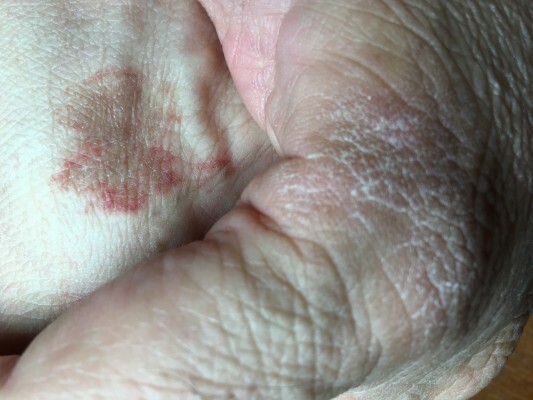 Progressive neurologic dysfunction in a psoriasis patient treated with dimethyl fumarate. Ann Neurol. 2015;78(4):501–514. Longbrake EE, Cantoni C, Chahin S, Cignarella F, Cross AH, Piccio L. Dimethyl fumarate induces changes in B- and T-lymphocyte function independent of the effects on absolute lymphocyte count. Mult Scler. 2018;24(6):728–738. Chaves C, Ganguly R, Ceresia C, Camac A. Lymphocyte subtypes in relapsing-remitting multiple sclerosis patients treated with dimethyl fumarate. Mult Scler J Exp Transl Clin. 2017;3(2):205521731770293. Barber SM, Teh BS, Baskin DS. Fractionated Stereotactic Radiotherapy for Pituitary Adenomas: Single-Center Experience in 75 Consecutive Patients. Neurosurgery. 2016;79(3):406–417. Hasegawa T, Kobayashi T, Kida Y. Tolerance of the optic apparatus in single-fraction irradiation using stereotactic radiosurgery: evaluation in 100 patients with craniopharyngioma. Neurosurgery. 2010;66(4):688–694; discussion 694–695.